Lithotherapy is an energy therapy made with crystals. It is an indispensable energy refueling nowadays. The positive energy that the crystals emanate directly acts on the health, the disposition and the joy of living. It induces deep relaxation, calming the mind and promoting a sense of balance, peace, and harmony. Crystals are used to restore energetically the mineral deficiencies that cause changes in the functioning of our body and our metabolism, treating physical, mental and emotional diseases. Lithotherapy harmonizes, energizes and revitalizes the Being as a whole. Removes and treats the tensions, emotional blockages, and negative energies that are stagnant and accumulated in the body, which cause disease and drain our energy. It is also a therapy that leads to self-knowledge, inner strengthening, and awakening of our physical and spiritual virtues. There are very few examples of crystals and minerals being used in healing therapies for some different cultures around the world and even the Bible is replete with crystal references. There are records of Ayurveda from India and also in traditional Chinese medicine about five thousand years ago all describing the healing properties of crystals and minerals. Today, crystals are essential tools for some daily technologies, so we can see how the stones act in our daily lives. Ruby and diamond lasers to cut glass or even granite that may one day be the sidewalk of our homes among other things in general. In the meantime, everyone is free to form their own idea using the crystals and stones all day. But most important of all, we are all free to find the benefits that crystals and Lithotherapy have to offer us. Within the history involving the crystals, we come across various civilizations that used the crystals for healing, prosperity, fertility, love, and protection. 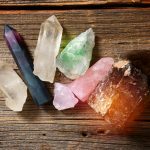 However, there is a lot of work involving crystals and magic, such as the correct way of using crystals to combat evils, spells, and incantations, elixirs for environments, crystals that give abundance and wealth to the home and of course not forgetting those who help in the field of love and personal protection. If we consider that we are made of energy and that thoughts and feelings are also forms of energy, we can conclude that maintaining a balance in our energy field is fundamental for good health. A small imbalance in this energy field, also called the Aura (or morphogenetic field by science), can cause chemical changes in various organs. These changes, generated by feelings and negative thoughts or energy contaminations, can cause failures in the functioning of our internal systems and then generate the most diverse types of diseases. A few stones to cleanse your aura are Celestite, Aqua Aura, Larimar and Lepidolite.